As the vision of businessman Guido Pfister and his son, Charles, The Pfister opened in 1893, billed as the “Grand Hotel of the West,” a welcoming and luxurious meeting place. We are proud to be celebrating 125 years in 2018. Succeeding on both fronts, this historic Milwaukee hotel was the most lavish hotel of its time, costing nearly $1 million; it featured groundbreaking innovations such as: fireproofing, electricity throughout the hotel and individual thermostat controls in every room. Designed by architect Charles Koch, the hotel features a Romanesque Revival design. Fast-forward to 1962, when, after over half a century of operation the Pfister was showing its age. Movie Theatre operator Ben Marcus purchased the hotel at auction with the intent of renovating the historic Milwaukee hotel to its original beauty. As part of the Marcus investment in the property, a new 23-story guest room tower was added in the 1960s as well. Since opening well over a century ago, The Pfister has and continues to host the world’s most celebrated entertainers and dignitaries. Collected by Guido and Charles Pfister, the hotel houses the largest Victorian art collection of any hotel in the world. Visitors can explore and learn about this art collection with a self-guided tour or a schedule tour with the hotel’s current Artist-in-Residence. 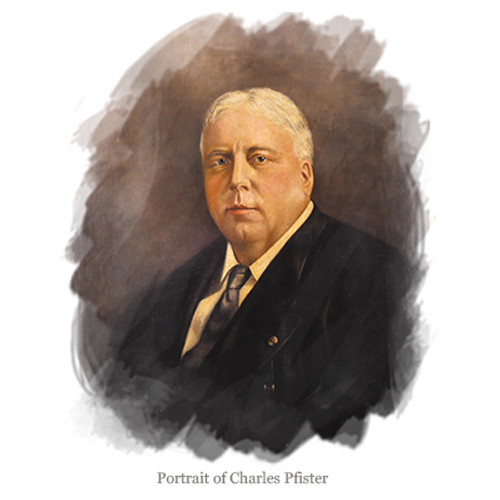 Guided by “Salve” - a philosophy of the finest hospitality – associates of the Pfister carry on the legacy of excellence established by Guido and Charles over a century ago. For 125 years, The Pfister Hotel has stood as an icon of prestige, history and timeless excellence in Milwaukee. Pfister associates strive to ensure that when guests arrive, they come to a warm and friendly place that is much more than a hotel – it’s an experience. As Milwaukee’s renowned luxury hotel, The Pfister has brought history, a celebration of art and a philosophy of exceptional hospitality to locals and visitors alike.